Last Friday was a wet night for trapping moths but I persevered anyhow because of the mild weather and it was indeed well worth it! With 61? species in total and some great garden records, but with a noticeable drop in numbers. 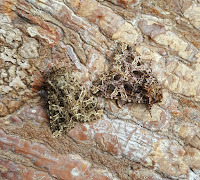 Highlights were year first species of Toadflax Brocade (I still never have trapped the first brood) and Bordered Pug (2nd garden record and last seen in 2014). Also I had never trapped the often confused pair of species Lychnis and Campion together before until this night. The weather is pretty changeable now and we are back to the unsettled weather just as the summer holidays start!